The Dumfries town bus network provides excellent access from the main residential areas into the town centre. Travelling by bus is a convenient, comfortable way to travel. Travelling by bus is a convenient, comfortable way to travel around Dumfries. Find out more. Information: download our bus map and bus timetables to find out about bus services you can use for commuting and leisure trips in Dumfries. Find out more. Journey Planner: Create your own personalised journey plan. Find out more. Ten places to explore using the bus: Find out where you can travel to in Dumfries using the bus. Find out more. 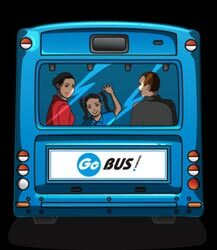 Take a GoBus Challenge: Set yourself a challenge to GoSmart. .
Top Tips: on how to make bus travel fast, cheap and easy. Find out more. your GoBus stories and suggestions: what would encourage you to use the bus more often? What's stopping you from using the bus more? Find out more.